Well. This blog is but a month old and already I’m slacking a bit. Many apologies, but I promise I have a good reason. The day after Valentine’s Day (Monday) I called in sick from work. This is a big deal, as we only get two sick days a year. (Yes really, only two. I’m serious.) It was day four of a blinding migraine; I had no choice but to call in to work and see a doctor. Before even picking up the phone, Dan looked online at my employee status to make sure that I had indeed accrued sixteen hours of sick time. Upon discovering I had, I called the station (two hours before I was supposed to be at work) and told them I’d had a migraine for four days and that I was seeing a doctor and would return on Tuesday with a work release form. The person who answered the phone then sent out an email to the staff that said that I was out sick, and I was going to have a doctor’s note on Tuesday. Evidently, a reporter also had to call in sick that day. I didn’t know this when I called in because last I checked, it isn’t my job to keep tabs on who calls in sick on the day that I’m sick. Or is it? Wait. I’m getting ahead of myself. BODY: Let me be clear about who is allowed to call in sick. You are ONLY allowed to call in sick if you are a full time employee. Part time employees do NOT get sick time at all. I have been full time since April 2009. Full time employees get only two sick days a year. I have one left, after the day in question. If you are calling in sick on a day before or after your weekend starts (if your weekend is Saturday and Sunday those days would be Friday and Monday) you MUST have a doctor’s note. Good thing the email sent out saying I was sick on a Monday also mentioned that I would have a doctor’s note on Tuesday. You can not just call in sick any day you feel like it. You must be legitimately ill to do this. We don’t allow mental health days. Do I really need to comment here? Oh goodness. Typing this out is making me more mad an entire week and some change later. He then went on to talk about how when more than one person calls in sick it puts everyone in a bind, blah blah blah. Look. It isn’t my fault that we were sick the same day. If I’m so sick that I need to call in, I’m not going to stop in my tracks and check my work email first to make sure that no one else has called in that day. And moreover, I followed the proper procedure! I was actually sick! It wasn’t a “mental health day” (though working in news should freaking warrant at least one a month, in my humble opinion.) I wasn’t extending my weekend, and even if I bloody well was, I’m an adult, for God’s sake! If I have only two sick days a year, can’t I use them any way I want? Ugh! Must I freaking PROVE to you that I was sick, because you are my mommy and don’t want to catch me playing hooky? LORD! Fast forward to Saturday night. Dan drives me to the ER as I suffer through the worst migraine I’ve had in my entire life. I can’t see, I can’t breathe. All I can do is scream and sob in excruciating pain, pray for a bullet to the brain if I can’t have painkillers, and thank God this is happening on a Saturday and that I can be at work on Monday and not be forced to use my last (insert expletive of choice here) remaining sick day on another bloody migraine. I get morphine in my veins (wonderful stuff, that morphine) and a CT scan and blood work that collectively tell the doctors that I’m “in perfect health.” I’m perfectly healthy? Why hot damn! This is fabulous! But! It is also deeply discouraging because I was sure the CT scan would expose the problem in my brain that causes these migraines and alas, it did not. I’ve had a minor headache ever since the trip to the ER. And it has now dawned on me the cause of the worst migraine of my entire existence. For Lent this year, I am fasting fried foods and all beverages that aren’t water. Only while in the hospital bed did I finally think to myself that I can’t remember a time in my life when I haven’t regularly consumed caffeine. I have one or two (sometimes more, let’s be honest) Diet Cokes a day, maybe a cup of coffee or two or five. And for the first time since babyhood, I’m now caffeine free, with the hellacious withdrawal symptoms to show for it. But the good news is that I have slept like a BABY ever since. Like I’ve said before, the only other chronic ailment I deal with is insomnia, and perhaps cutting caffeine out of my life will resolve both that and migraines. Oh God, please, let it resolve both. PLEASE. All this to say, after Lent, I’m done with caffeine. Seriously. Done. Diet Coke and coffee both come in decaf, and that is all I shall have. I’m really excited and encouraged about what this is going to do for my body. Taking a drug out of my life can only make me better, right? 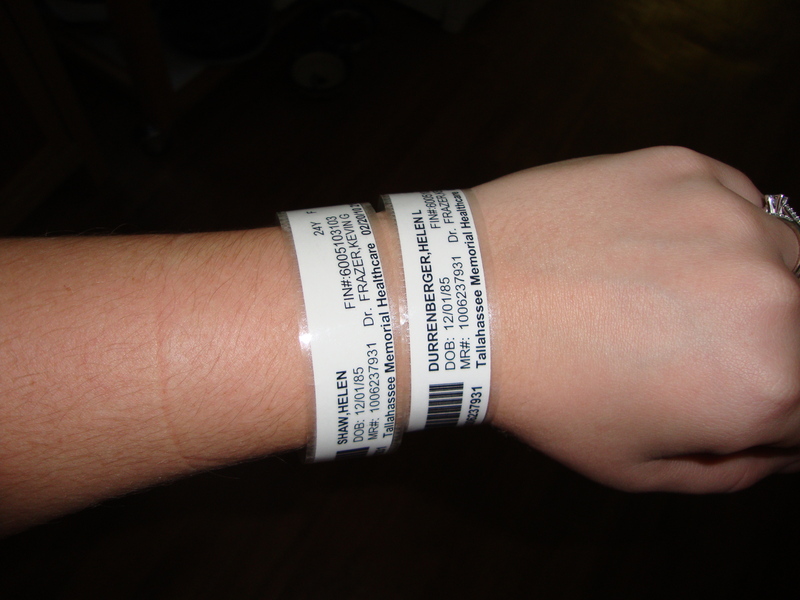 Check out my sweet wrist bands from the hospital. The staff evidently didn’t know who I was, so they tagged me as both my maiden and married name. You are SO jealous of my two wrist bands. And finally, three cheers for my unconditionally loving husband who stuck by my side through the whole thing, stayed awake through the night with me, and who has never looked so sad as he did when he watched me writhe in pain. I love him more than words could ever say. So glad you are feeling better. I thank God for Dan, he is such a wonderful husband to my sweet daughter. I pray for the headaches to stay away now! Caffeine will do that to ya! My mom has been drinking diet coke ever since she was diagnosed as a diabetic when she was 18 and when she tried to get off it a couple years ago she had awful headaches. Just makes me think even more about all the crap we put into our bodies. I’m glad you are feeling better and have figured out the problem! Wow, your boss’ note is craziness, I can’t begin to explain the horror that came over me reading his e-mail. ughh 🙂 I came upon your blog and read this post and the note just got me. I had to comment! I’m so happy you’re doing better. Isn’t it wonderful that Lent gave you an opportunity to realize something that was causing you pain? I don’t want to jump the gun, but you might just get rid of all or most of your migraines. And you’re setting a wonderful example for me! I’m taking the slow approach, but I’m definitely trying to cut caffeine out of my life. Too many kidney infections! I love that you have a blog. I recently revamped mine, check it out if you get a second. Pingback: fueled by water and herbal tea. « ramblings of a twentysomething journalist.